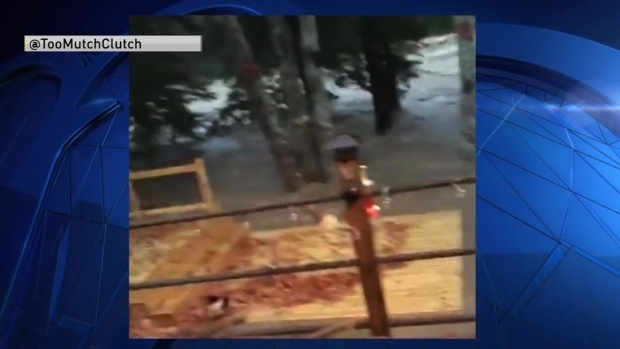 Video posted by the Jackson Area Chamber of Commerce shows dramatic flooding at Jackson Falls in New Hampshire. Water rescues are underway after a coastal storm that hit New England overnight caused flash flooding of the Saco River in New Hampshire's White Mountains area Monday morning. Bartlett police said the river had risen to nearly 13 feet by 6 a.m. Meanwhile, Jackson Falls in nearby Jackson was raging and flooding its banks. The storm, which dumped five inches of rain on Bartlett alone, was responsible for flooding multiple roads. Bartlett authorities said the worst of the flooding was River Street and Cobb Farm Road. A coastal storm caused flash flooding of the Saco River in New Hampshire on Monday morning. It was not immediately confirmed if anyone had been trapped in the floodwaters; however, water rescues were caught on camera by Waterville Valley resident Lisa Tremblay, who was also rescued from the area.